Let's face it - we all have rough weeks every now and again. I had one this past week. May be its the heat, maybe its the hormones...I don't know. Let's just say I'm glad it is a new week. Really glad. And I don't know about you, but when I'm in a funk I crave comfort food. To me nothing is more comforting than a big pile of fried potatoes. Lucky for me my CSA has supplied me with plenty this year, as well as these purple jewel-like shallots. Aren't they adorable? I feel better already. I started making my better mood dish with a generous drizzle of extra virgin olive oil in a large skillet that I heated on medium. 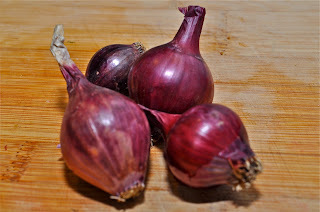 Next I peeled and diced the shallots and tossed them in the pan. While they got fragrant, I washed and scrubbed the red potatoes. I poked them each with a fork a few times and placed them in the microwave for about three minutes - just enough to soften them some. 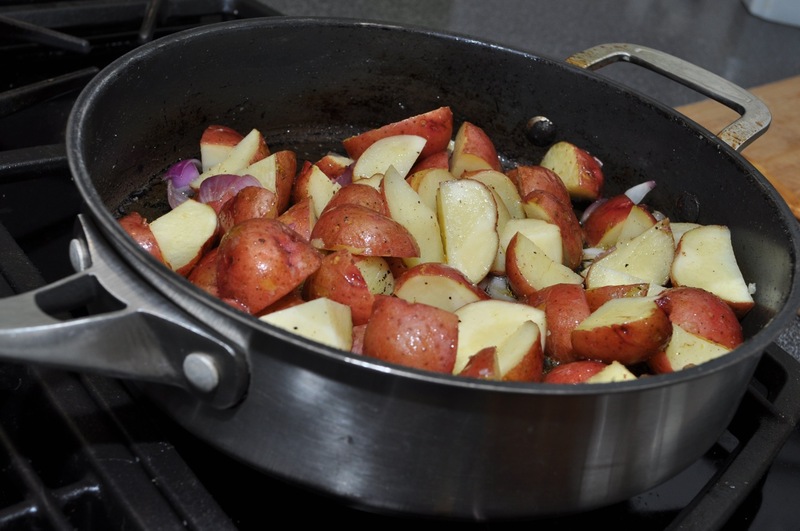 I then cut the hot potatoes into chunks and added them to the skillet of simmering shallots. Just a bit of kosher salt and freshly ground pepper topped the mixture. I cooked them til they were a bit brown, but not burned. Once ready, I transferred them to our waiting plates and sprinkled a bit of fresh thyme from the herb garden on top. Like I said, nothing is more comforting. With my belly full of starchy heaven, I was in a much better mood. Funk fizzled...finally. 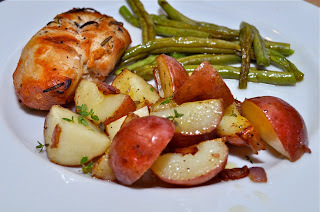 That night we also had garlic green beans. The carnivore had a rosemary grilled organic chicken breast, while I had a big tomato salad. We have had purple yard beans, but no green ones yet.